I'll start out with a few Facebook style lists, and then move into telling stories about specific activities I've engaged in over the years. These lists are in no real order, other than what pops into my head as I'm typing, and are probably just a representation. I may update them as time goes along. I'm trying to give a good mix of old favorites and new. What I did was make monsters such as Godzilla and King Kong out of paper in 3 dimensions, along with set pieces such as airplanes and buildings. Everything had an action that could be initiated by pulling on threads. Airplanes would sail down a thread toward King Kong at the pull of one thread. He would then swat the plane when another thread was pulled. When the plane hit the bottom of the thread, a final thread would lift flames up from the ground. Godzilla would slap his tail and breathe long tongues of flame. You get the picture. I know that I dreamed of filming it and making little monster movies, but camera technology when I was that age was expensive. We had an 8mm reel to reel, but most of the time, we couldn't afford sound film. So, I never filmed anything. I remember creating my own Transformers figures out of Legos. Each one was unique, and I had my own building plans drawn up for them so I could reconstruct them after tearing them down. They also transformed from robot to vehicle and back by moving the minimum amount of bricks I could manage. Again, we were poor, so I had to make my own toys when it came to expensive brand name properties. As I got older, I started making my own games. You can read about all of that in the "Game" section of this page. I was in Boy Scouts, and though I only made it to First Class, I also stayed on as an assistant Scoutmaster for a couple of years. Odds are that you can see that influence in my writing every once in a while. You'll absolutely see it in my Magic of the Wood series, right from the first story. Another place you'll see it is in Kindred of the Wood, which is set in the northern Minnesota part of Boundary Waters Canoe Area. I took two week-long canoe trips up there with the scouts, and I wish I'd had the opportunity to go more often. I also spent a week backpacking through the mountains of New Mexico. Up until high school, camping, fishing, and other outdoor activities were common for me. In high school, there were two classes I took simply because there weren't any other electives that I was interested in. I was never one for wood shop or automotive. That left me with typing and computer programming. The first has proved a vast boon in the internet age, and you can't fix most of the crap that goes wrong with today's computer-controlled cars using what they taught in high school anyway *laugh*. It was the computer programming class that really set me on the course where I am today, though. The school was poor, so there were only a reasonable number of ancient TRS-80 computers for the class. We had an Apple IIe network and some more advanced Tandy computers, but those were part of the computer lab, and usually in use for English composition and the like. I had a dream of creating a game on the computer that was a mix of Dragon Warrior and my own fantasy world from the pen and paper game. It was a driving force for me. Within six weeks of the start of the school year, I had already gone beyond the textbooks for the BASIC class and delved into the technical manuals, looking for the functions I needed to make my games work. I would knock out the programs required for the class in a few minutes, then get right back to programming my game. The teacher, fascinated by my tenacity, just let me go with it. In the end, "Realm of the Gladiator" took up 3 5-inch floppy disks, and the teacher ended up keeping some of my advanced code for things such as the battle modules for use in teaching the second year of the class *laugh* When I turned it in as my final project, it only sat on the desk for about a second. She just marked it A+ and handed it back to me, keeping the copy of the game for teaching later. If I can find it, I'll scan some pages from the notebooks where I wrote all the code. It took up more than one standard notebook. I may even have some of the printed pages, and perhaps stuff from the later version, programmed on a friend's color computer that added beeping sounds and color to the game. There was an even later version written in Qbasic that had actual moving graphics, random encounters, and a storyline, but it never got beyond the first town. I started working pretty much right out of high school on the graveyard shift at the local grocery store. I spent most of my free time fishing, camping, canoeing, mudding in 4WD trucks, and getting drunk. The latter was usually involved in all of the former. One of the highlights was always cliff jumping. The local strip mine pits were all straight up and down cliffs, up to 60 feet high, and they just kept going down at the water. That meant you could nearly walk off the cliffs and into safe water. Unfortunately, you usually had to swim quite a distance to get back to anywhere you could climb back up *laugh* We were the unofficial caretakers and regulars at Augusta pit, which hosted people from far and wide. We regularly stayed all day, getting drunk and grilling. Since I'm afraid of heights, this might seem an odd activity. The thing is, I'm okay as long as I can't see open air beneath my feet. I can't climb a fire tower, but I can jump off a cliff damn near as high. Even then, I never would have done it if my little brother hadn't jumped off the cliff we called "Lardass" first. At that point, I had little choice, and loved the experience once I got over the fear and took the leap. My characters first came back to life on the internet on AOL, in the "Red Dragon Inn". I used all of my alternate sign-on IDs to create characters. The ones who made the cut were Darkniciad, Thakkor, Mindblind, Geflon, and Zoraster. I role-played them at the Inn, and actually quite enjoyed the experience. It got me back into the games and my world, which ultimately resulted in my writing. I'd been dissapointed for many years by rumors of new Dragon Warrior games that never came. We were supposed to get 5, but it was cancelled. Then 6 was supposed to be our 5, and it was cancelled. It's only in the last couple of years that these games have actually arrived in America. So, to get my fix, I cruised the internet looking for Dragon Warrior stuff. My major contribution, however, was the Dragon Warrior/Quest Midi Shrine. Back then, MP3s and such simply weren't viable. They ate up too much space on your computer. Midis, however, were small, and produced sounds close to the original game music. I quickly developed a knack for cruising the Japanese Dragon Quest sites, where there was a huge fan Midi community, despite my inability to read the language. 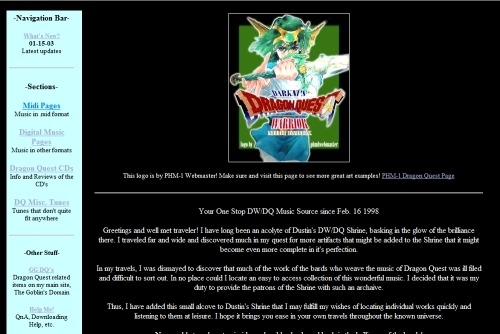 Thus, I had the largest complete collection of Dragon Quest Midis on the internet, and even Japanese websites linked to me. Screen Shot of the Midi Shrine. Click the thumbnail to view in an overlay, or Here in a new window. Screen Shot of the Goblin's Domain. Click the thumbnail to view in an overlay, or Here in a new window. In '99, I met Bailey. Soon enough, I was hosting a fan page for her that eventually became her homepage, called the Shrine of Baileykins. Unfortunately, I don't have any copies of these ancient pages. They were just a series of screenshots of her on cam, presented with a celtic cross background, and with "The Prelude" from Final Fantasy playing behind it. After we got together, I decided to update the little fan page into a full-fledged website for her. This was Bails for REALS. Screen Shot of Bails for REALS. Click the thumbnail to view in an overlay, or Here in a new window. This website had all sorts of information about how to act in her chat room, what she would and wouldn't do in a private show, a member's only area with special pics, a forum where chatters could interact with her, the ability to deliver personalized pages to each member with birthday greetings and such, java games such as hangman, a shooting gallery featuring cartoon versions of the "chatmonkeys", poker, blackjack ( games presented exclusive pics as prizes for winning or score ) a downloadable pinball game based on her, and much more. 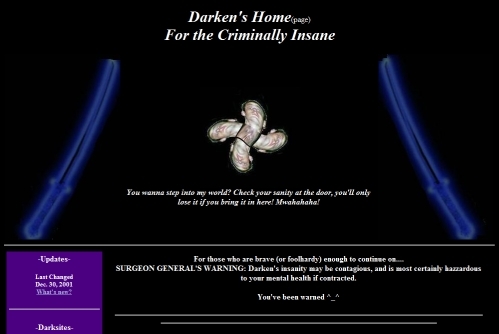 At the same time, I was also operating my own homepage in my chat persona as "Darken" called Darken's Home(page) for the Criminally Insane, separate from the Goblin's Domain. Screen Shot of the Darken Homepage. Click the thumbnail to view in an overlay, or Here in a new window. One of the websites I visit has a forum that included a neat little feature called an attack system. With this, you could attack other members, kill them, and collect "frags" as bragging rights. If the member had more frags than you, you could even steal part of their frags when you killed them. It was quite fun, and I had an idea to expand on it, giving it some RPG elements. And thus, my XMB forum attack system mod was born. Screen Shots of the XMB Attack System. Click the thumbnail to view in an overlay, or one of the following links to open in a new window. The attack system was available on Bailey's forum. It included things like stealing, lots of admin controls, offensive and defensive magics, potions, magic weapons, and much more. People liked it, but it was actually a little too complicated. One of my testers, also a member of the forum where I got the idea for my attack system, was programming his own attack system for the Invision brand boards. Already an established mod maker, famous for advancements in the IPB Arcade mod, he asked me if I wanted to join forces with him. Invision was a much more popular forum platform ( indeed, it's the one running on my website now, while XMB is dead ) so I jumped on board, and took on the task of programming the guilds part of the attack system where members could join together in groups to plan and share resources. Screen Shots of the Guilds in IBProBattle. Click the thumbnail to view in an overlay, or one of the following links to open in a new window. In a guild, you had a private chat, the ability to heal members with items or by donating your own stats, a treasury you could make withdrawls from to purchase items, a private guild store, an attack and ally list to quickly find targets or help allies, and much more. The core attack system, which I also coded for, had a lot of neat features, but was much more balanced and easier to use than my XMB attack system. This attack system is still widely in use on Invision 2.0 boards, and "Darkniciad.Bot" is one of the ultimate targets in the game. When I go to do a stolen story search in Google, I have to purposely eliminate all these attack system hits, or I'll never find anything but them *laugh* One day, I might even add it to the forum here, if there are ever enough active members to make it worthwhile. Most recently, outside of my writing, my only creative pursuit has been a video FAQ/Let's Play of the Taito Arcade Game "Gladiator". You can view it right here: Let's Play Gladiator. If you don't actually want to know the tips and tricks to playing the game, skip ahead to part 6 for the straight play-through of the game through normal and hard mode. That's all I can think of for now, but it should be enough to give you an idea of the sort of things that have influenced/interested me over the years.